Custom medications for infants and children at Williams Bros.
It’s no secret that most kids don’t like taking medication. Here at Williams Bros. Health Care Pharmacy we try to make the experience more pleasing. We have alternate dosage forms and a variety of flavors that can please almost any child. We custom make children's medications for cold sores/fever blisters, diabetes, diaper rash, head lice, oral thrush, pain relief, respiratory disorders, skin disorders and much more. Our most common flavors include Banana cream, bubble gum, butterscotch, cherry, grape, marshmallow, peppermint, raspberry, strawberry, tangerine. Ask about additional flavors also. 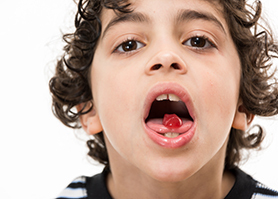 Dosage forms suitable for children/infants include suspensions, lollipops, suppositories, troches (a lozenge that dissolves), lip balm, capsules, pacifier or bottles for infants. If you have any questions or concerns about compounded medication for your child, please don’t hesitate to contact a Williams Bros. compounding pharmacists. If you have any questions or concerns, please don’t hesitate to contact a Williams Bros. compounding pharmacist.